Sultan Agung Islamic University popularly known as UNISSULA which stands for Universitas Islam Sultan Agung was established by Yayasan Badan Wakaf Sultan Agung (YBWSA) on Dzulhijjah 16th, 1381 Hijri which corresponded to May 20th, 1962. The university was named after the national hero of Sultan Agung (literally, “Great Sultan”) as the third Sultan who ruled Mataram Sultane from 1613 to 1645. The King, Sultan Agung Adi Prabu Hanyakrakusuma, was born in Kotagede (now becomes part of Jogyakarta) in 1593. During his sultanate, Mataram was a great sultanate, developed rapidly, and eventually became the biggest kingdom in Java Island and Nusantara. There were several reasons for selecting the name of Sultan Agung as the name of the University. First, Sultan Agung was a great leader who considerably loved his nation and country, he was a symbol of nationalism. Second, he was tremendously persistent against colonialism. Third, he was a religious Sultan with noble character and was able to implement religious life through acceptable acculturation across his territory. This was not a surprise that his dedication as a patriot as well as a humanist made him be an Indonesian national hero that this was officially reinforced with presidential decree No. 106/TK/1975 on November 3rd, 1975. By adopting the name “Sultan Agung”, UNISSULA expects that the spirit of struggle against colonialism and for national development can be maintainned and kept alive through the provision of high quality education. Today, UNISSULA has 31 Under Graduate programs, 7 Master Programs, and 3 Doctorate Programs on the fields of Medicine, Dentistry, Engineering, Law, Economics, Islamic Studies, Nursing, Industrial Technology, Language and Communication, Education, and Psychology. 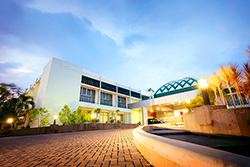 All programs are accredited by The National Accreditation Board of Indonesian Universities (BAN-PT).